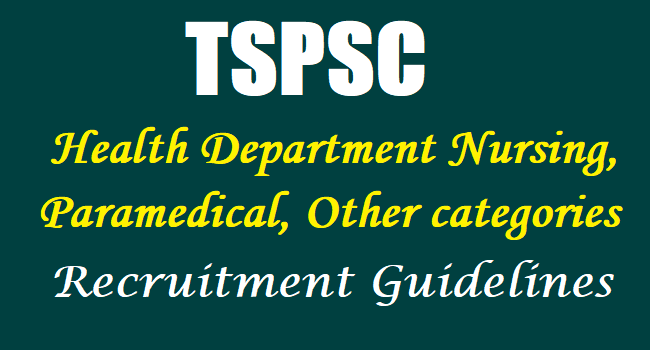 TSPSC Health Department Various Category Posts Recruitment Guidelines download, TSPSC Health Department Nursing, Paramedical, Other categories Recruitment Guidelines download: Administrative Officer, Paramedical Ophthalmic Officer, Radiographer, Staff Nurse, Assistant Statistical Officer, Lab. Technician Gr. II, Pharmacist Gr.II, Lab. Technician Gr. II, Pharmacist Gr.II, Assistant Librarian, Staff Nurse, ANM / MPHA (F), Physiotherapist, Pharmacist Gr.II, Lab. Technician posts recruitment guidelines. TSPSC to fill 1339 posts in Health Department. TSPSC Nursing, Paramedical, Other categories Recruitment. TSPSC Staff Nurses, Physiotherapists, Radiographers, Paramedical Opthalmic Officers, Refractionists, TSWRDC Health Supervisors Recruitment 2017: TSPSC Staff Nurses, Physiotherapists, Radiographers, Paramedical Opthalmic Officers, Refractionists, TSWRDC Health Supervisors Recruitment 2017, TSPSC Staff Nurses, Physiotherapists, Radiographers, Paramedical Opthalmic Officers, Refractionists, TSWRDC Health Supervisors Posts Online application form, TSPSC Staff Nurses, Physiotherapists, Radiographers, Paramedical Opthalmic Officers, Refractionists, TSWRDC Health Supervisors hall tickets, TSPSC Staff Nurses, Physiotherapists, Radiographers, Paramedical Opthalmic Officers,Refractionists, TSWRDC Health Supervisors Answer Key, TSPSC Staff Nurses, Physiotherapists, Radiographers, Paramedical Opthalmic Officers, Refractionists, TSWRDC Health Supervisors Selection list Results, Exam pattern, Selection procedure for TSPSC Paramedical staff, ANM, Lab Technician, Staff Nurses, Physiotherapists, Radiographers, Paramedical Opthalmic Officers, Refractionists, TSWRDC Health Supervisors, Pharmacists and other posts 2017 and more details @ tspsc website. TSPSC Health Department Nursing, Paramedical, Other categories Recruitment 2017/TSPSC Health Department Posts. TSPSC Paramedical Staff Recruitment. TSPSC Nursing & Para Medical posts. The Telangana State Public Service Commission (TSPSC) has issued notification for recruitment of 1261 various posts in Health Medical & Family Welfare Department, Insurance Medical Service and Telangana Social Welfare Residential Degree Colleges (TSWRDC) Women. Of the total posts, 1196 are of staff nurse in Directorate of Public Health and Family Welfare (DPH&FW), Telangana Vaidya Vidhana Parishad (TVVP), 35 radiographers in DPH&FW, 21 Health Supervisors in TSWRDC (Women), six physiotherapists in TVVP, two Paramedical Opthalmic Officers in DPH&FW and one refractionist in Insurance Medical Service. The TSPSC in a release on 08-11-2017 advised candidates to visit its website www.tspsc.gov.in for detailed information. Submission of online application will begin from November 16 and last date to apply is December 11. Notification Number - Name of the Post -No. of Vacancies - Departments in the state of Telangana. The TSPSC issued notification for recruitment of 1261 various posts in Health Medical & Family Welfare Department, Insurance Medical Service and Telangana Social Welfare Residential Degree Colleges (TSWRDC) Women. Of the total posts, 1196 are of staff nurse in Directorate of Public Health and Family Welfare (DPH&FW), Telangana Vaidya Vidhana Parishad (TVVP), 35 radiographers in DPH&FW, 21 Health Supervisors in TSWRDC (Women), six physiotherapists in TVVP, two Paramedical Opthalmic Officers in DPH&FW and one refractionist in Insurance Medical Service. a) Intermediate with Biology and Physics or Maths and Physics. b)Two years Diploma in Para-medical Ophthalmic Assistant Course from Government Recognized Institute. b)General Nursing Midwifery (GNM)/B.Sc(Nursing) c) Registered with AP/TS Nursing Council. GOVERNMENT OF TELANGANA ABSTRACT HM&FW Department - Filling up of posts in Health, Medical & Family Welfare Department - Guidelines for filling up Nursing, Paramedical & Other categories through TSPSC, in relaxation of rule 9 (b) of the State and subordinate service rules, 1996 - Orders - Issued. 1. G.O.Ms.No.763, GA (SPF-A) Dept., dt:15-11-1975. 2. G.O.Ms.No.565, M&H (R1) Dept., dt:27-08-1979. 6. G.O.Ms.No.404 M&H (K) Dept., dt:17-7-1985. 10. G.O.Ms.No.1539 HM&FW(J2) Dept., dt:06.11.2010. 12. G.O.Ms.No.176, HM&FW(B1) Dept., Dt:19.12.2016. 13.From the Addl. Secretary, TSPSC, Hyderabad Lr.No.538/Rectt- II/2016, Dt:7.2.2017. ORDER: In the reference 11th read above, the Government have accorded permission to fill vacancies of various categories in Health Medical and Family Welfare Department, through direct recruitment by Telangana State Public Service Commission, keeping in view the actual requirement of manpower with reference to the nature of work and activities of the department and also the overall financial implications. The Finance Department have requested to furnish details i.e., local cadre wise vacancy position, roster points and qualifications, department guidelines etc., to the recruiting agency. HOD wise and category wise vacancy position etc. 4. In the reference 13th read above, the Telangana State Public Service Commission has informed that after formation of Telangana, the Government have reviewed various schemes of Examinations to be conducted by the Telangana State Public Service Commission, and after careful examination of the matter, the Cabinet Sub-Committee have classified certain categories of Civil posts into Group-I Service, Group-II Services, Group-III Services and Group-IV Services, Gazetted Category & Non Gazetted Category posts etc. and prescribed the scheme and pattern of Examination for Direct Recruitment through Telangana Public Service Commission vide G.O.Ms.330, GAD (Ser.A) Department, dt:27-07-2015. As per above G.O. these posts come under Gazetted Category and Non Gazetted Category. a) Administrative Officer (DPH): Category (5) of G.O.Ms.No.458, HM&FW (C2) Dept, dt:14-10-1998.
b) Paramedical Ophthalmic Officer (DPH): As per special rules issued in G.O.Ms.No.404 M&H (K2) Dept., dt:17-7-1985.
c) Radiographer (DPH): Class –II (2) of G.O.Ms.No.565, M&H (R1) Dept., dt:27-08-1979.
i. DPH: Branch II Category- 3 of G.O.Ms.No.2035, HH&MA Dept., dt:27-9-1965.
ii. COMMISSIONER, TVVP: In Branch-III Class-B, Category-3 of G.O.Ms.o.48 HM&FW(C1)Dept., dt:29-1-2000 adopted to TS in G.O.Ms.No.3 HM&FW(B2)Dept. dt:7-1-2016.
iii. Assistant Statistical Officer (DPH): As per special rules issued in G.O.Ms.No.462, M&H Dt:19-5-1984 amendments from time to time. i DPH: Class-XI Category (1) of G.O.Ms.No.565, M&H (R1) Dept., dt:27-8-1979.
ii DME : Class-XI Category (1) of G.O.Ms.No.565, M&H (R1) Dept., dt:27-8-1979.
iii COMMISSIONER, TVVP: Branch-VII Class.B Category-3 of G.O.Ms.o.48 HM&FW(C1)Dept., dt:29-1-2000 adopted to TS in G.O.Ms.No.3 HM&FW(B2)Dept. dt:7-1-2016.
i DPH: Category (2) of G.O.Ms.No.727, M&H, Dt:26-3-1965. ii DME: Category (2) of G.O.Ms.No.727, M&H, Dt:26-3-1965.
iii COMMISSIONER, TVVP : Branch-VII Class.C Category-3 of G.O.Ms.o.48 HM&FW(C1)Dept., dt:29-1-2000 adopted to TS in G.O.Ms.No.3 HM&FW(B2)Dept. dt:7-1-2016.
g) Assistant Librarian (DME) : As per G.O.Ms.No.565, M&H (R1) Dept., dt:27-8-1979 as amended vide G.O.Ms.No.207, HM&FW (H) Dept., dt:5-6-2008.
h) ANM/MPH (F) (COMMISSIONER, TVVP): In Branch-III Class-B, Category-5 of G.O.Ms.o.48 HM&FW(C1)Dept., dt:29-1-2000 adopted to TS in G.O.Ms.No.3 HM&FW(B2)Dept. dt:7-1-2016.
i) Physiotherapist (COMMISSIONER, TVVP) : In Branch-VII Class-D, Category-1 of G.O.Ms.o.48 HM&FW(C1)Dept., dt:29-1-2000 adopted to TS in G.O.Ms.No.3 HM&FW(B2)Dept. dt:7-1-2016. Administrative Officer Must possess a Bachelor Degree of any University in India established or incorporated by or under a Central Act, Provincial Act or a State Act or the Institutions recognized by University Grants Commission or an equivalent qualification. Assistant Librarian B.A/ B.Sc/ B.Com with BL.Sc of University established or incorporated under Central / State Act or an Institution recognized by UGC Desirable Degree in Biology knowledge of Computerized database. Assistant Statistical Officer Bachelor Degree in Statistic / Mathematics Commerce Economics from recognized University. Paramedical Ophthalmic Officer a) Intermediate with Biology and Physics or Maths and Physics. b)Two years Diploma in Para-medical Ophthalmic Assistant Course from Government Recognized Institute. Staff Nurse a)Must have passed XII Class or Intermediate or its equivalent examination recognized by Government. b)General Nursing Midwifery (GNM)/B.Sc(Nursing) c) Registered with AP/TS Nursing Council. Radiographer a)Intermediate with Science subjects and preference will be given to Graduates b) Must possess CRA. c) Registered with Para Medical Board AP/TS. Lab. Technician Grade-II a) Intermediate. b)DMLT or B.Sc (MLT) from recognized University. c) Must be registered with the Para-Medical Board AP/TS. Pharmacist Gr.II a) Intermediate b) D. Pharmacy. c) Pharmacy Council Registration. Physiotherapist Must have passed B.A./ B.Sc/ B.Com or its equivalent exam recognized by Government. Must have obtained training in Electro-therapy or Physio-therapy or Physical Training with Special preference to massaging for at least two years from a Government recognized Institution. ANM / MPHA (F) a) Must have passed SSC or equivalent examination; b) Must have passed MPHW (F) Training Course, conducted by Government of A.P and Telangana. c) Must have registered with the AP and Telangana Nursing Council. 18-44 years as per G.O.Ms.No.329, General Administration (Ser.A) Department, dt:27-07-2015 read with G.O.Ms.No.264, G.A. (Ser.A) Department, dt:26-7-2016 in the above category of posts. As per the existing Government orders issued by Government of Telangana from time to time in above all categories. VI) Reservation to Women: As per the existing Government orders issued by Government of Telangana from time to time in above all categories. (i) 3% of reservation in favour of persons with disabilities shall be appointed to the post of Staff Nurse and A.N.M. VII) The Rule of Reservations to Local candidates: As per the existing Government orders issued by Government of Telangana from time to time in above all categories. VIII) Age relaxation: The upper age limit also be allowed in accordance with the Rule 12 of the State and Subordinate Service Rules and as per G.O.Ms.No.329, General Administration (Ser.A) Dept., dt:27-07-2015 in the above categories. IX) The post of Administrative Officer shall be notified under the Group- I Services. X) Clarification of Experience: Continuous contractual service of six months or more would be required for assigning weightage. Service of less than six months would not be assigned any weightag Any candidate, whose contract was terminated for indiscipline or other delinquency, would not be awarded marks for the entire service rendered. If any candidate has worked for a few months/years in the rural areas and later in the tribal/urban areas, the weightage would be prorated based on the above criteria. Gap period in contractual service is not counted for weightage marks. However, total contractual service excluding any gap period will be counted for awarding contractual marks. Those who rendered the contractual service and left the job are also eligible for weightage for the period of contractual service rendered by them. The last date of submission of applications will be the cut off date for computing the contractual service. ANNEXURE-I Annexure to G.O.Ms.No.65 HM&FW(B1) Dept., dt: 18- 5-2017. 1 Hyderabad 39 Will be furnished separately. 1 Hyderabad 18 Will be furnished separately. 1 Hyderabad 06 Will be furnished separately. 1 Hyderabad 04 Will be furnished separately. 1 Hyderabad 00 Will be furnished separately. 1 Hyderabad 19 Will be furnished separately.